The bright and colorful Fisher-Price Infant-to-Toddler Rocker is an ideal place for your little one to eat or sleep. This cute-as-can-be chair can serve as a seat for play, meal time or nap time. The baby sleeper rocker includes many features that will keep your little one entertained for hours. It has calming vibrations and a reclining back to gently soothe your child to sleep. The 3-position reclining seat has a removable washable pad. 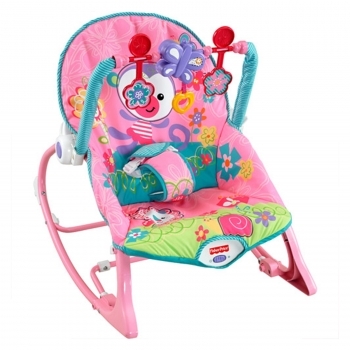 This girls' Fisher-Price rocker grows with your child, as it can be used by both infants and toddlers weighing up to 40 pounds. The foldout kickstand enables you to easily transition the seat from an infant seat to a toddler rocker. Your growing baby will continue enjoying all the fun this cute accessory has to offer. The Fisher-Price Infant-to-Toddler Rocker requires 1 D size battery (sold separately).